Wow, been too long since I last posted, but I’ve been a busy dude. Just spent the last eight to ten weeks cranking out the text for my next book project. I’m really fired up about this book, and am looking for an on the shelf date of late 2017. The text is done except for countless edits, but that’s never been the hard part for me. The hard part is all of the charts, graphs, illustrations and pictures. Going to rely on some talented friends to help out with all of that. Speaking of friends, I asked four from around the country, at various stages of their perspective fishing careers to read and edit for flow, content, etc. I really appreciate their help, and they will have special mention in the book. First book was out on June of 2011, second came out in December 2014, this one hopefully, in December 2017. Notice a pattern there? What it tells me is that it takes me about three years to learn enough new stuff to be able to write another book. That’s thousands of hours of on the water observations, note taking, and data collection. I was on the river yesterday and someone shouted to me the river temperature, and I honestly didn’t care. Oh, I will in a couple of weeks when the Blue Wings start popping, but yesterday was a diversion from the book day, so I simply nodded it off. I am still amazed at what I glean from simple water time in a relatively short time. It shows I’m paying attention AND there’s still more to learn! A lot more! This next book uses statistical information from hours and hours of dedicated note taking to flesh out the best techniques and flies to use as you progress on your fly fishing journey. It’s going to be roughly 55,000 words, plenty of illustrations and pictures should round it out. This years presentation is called Hidden In Plain View, and folks across the country seem to like it. The presentation mirrors the book as it gets into being able to recognize the obvious and exploit the obscure in fly fishing. It should have something for every level angler, and covers tactics from mini/skinny, double dry fly, nymphing, and streamer work. Crazy fun. So, with all that going on, I haven’t had much time to work on my annual winter technique. Most that have followed for a while will recall that I pick something to work on every winter during slack times in the season. This year, I decided to continue what I was working on last winter and last 2 years guiding seasons. I’ve been working on this covertly, simply because I didn’t feel as if it was ready to unveil. It’s no mind blasting technique, but I wanted to have the specifics dialed in before telling anyone about it. In the last three years I have begun to use “sighter” leaders in my suspended or hinged nymph rigs. A sighter leader allows the angler many benefits, but mostly for this indicator fishing it helps detect very subtle eats, and it gives you a great idea of what your rig is doing sub-surface in relation to your indicator. It’s a specialized leader I build using various poundages and colors of amnesia and monofilament lines. A few of the knot tags are left un-trimmed and further the sight capabilities. Many anglers don’t even realize what is going on sub-surface in regards to the indicator. We are so dialed into surface mending, that we don’t think about subsurface mending. We can see what is going on surface wise because of our fly line, but it’s often difficult to discern what is going on below the indicator. The sighter leader fixes that because it will clue you in as to when your leader turns over the indicator, and where your flies are at pretty much anytime within the drift. This has been a huge help to many of my clients as they begin to see how a few specialty mends can effect the entire sub-surface drift. They then can learn and employ a pile, stack, or pause mend with great effectiveness and confidence, because the results are observable through the sighter. Connect everything with a blood knot, and if you wish use a tippet ring at the end of the 10 pound red amnesia, it’s a fine idea. From the tippet ring attach your 16″ of 4x, 5x, or whatever mono or flouro to your first fly. You can place your split shot above the tippet ring to complete your in-line nymph rig. Upstream sighter leader work. Photo James Durden. I was fishing this rig just yesterday and noticed and set on the sighter movement more than a few times. The indicator never even twitched. It does take a bit of practice to use the sighter because it forces you to keep the indicator in your peripheral vision and use it as a secondary device. This just adds to your angling versatility as you begin to fish the entire vicinity around the nymph rig. Anyway, enough for now. I’ll be better with more consistent posts. Til then, get out and fish the sighter. Notice the blood knot tag location…mono to red amnesia line. “Feels like I’m fishing in a damn Margarita!” That’s what one of my long time clients blurted out as we fished through a slush hatch on the Eagle River last week. The slush was very thick because of the overnight cold water and air temperatures. 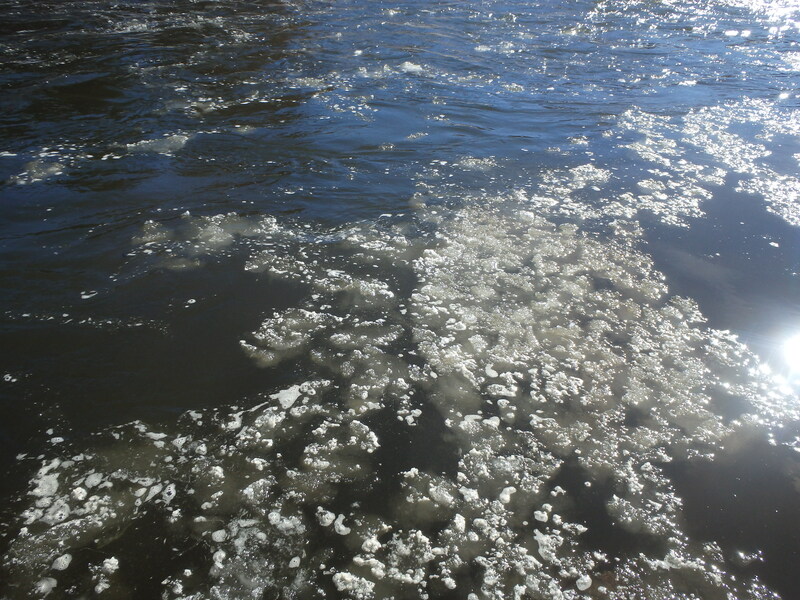 Slush is not at all an odd occurrence on rivers in the winter, but this “hatch” was beyond the norm. As we fished it I began to realize it wasn’t just on the water surface. Oh no, this stuff was flowing through all of the water columns. Bottom to top. Thankfully, we hooked plenty of trout, but it didn’t come without several modifications to our rigging. It was readily obvious that only about 20% of our drifts were actually getting down to fish level because the rig couldn’t punch through the slush. I decided I needed to revert to high water nymphing tactics to move fish. 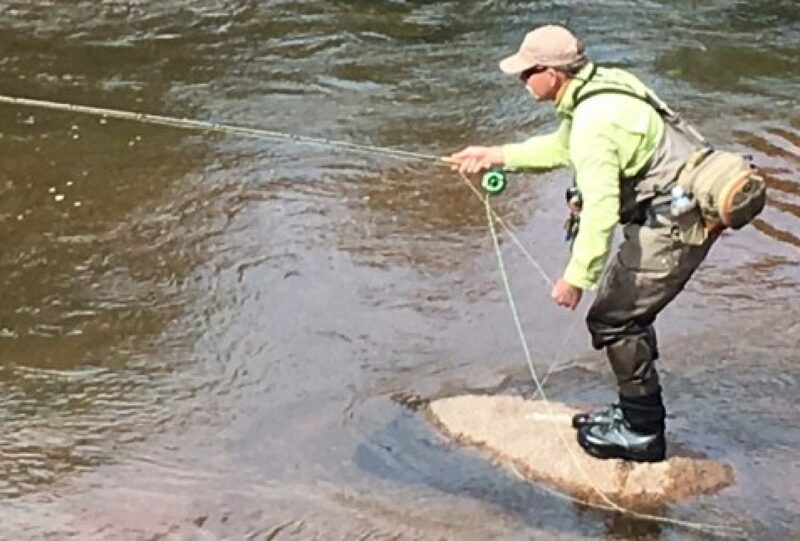 In high water conditions, it’s difficult to get the flies down quickly to fish levels. Fish levels in that water are typically in the lower columns, and more often than not, the fish are using bottom structure to fight the current. Same goes in slush, the fish are holding low to the bottom to escape flowing ice and will move side to side minimally to eat. Factor in the cold water conditions (37 degrees) and they will “sway” even less. They still gotta eat. Let’s discuss bugs first, then we will delve into the rig. Historically, I know that on most rivers in the winter, midges are the main course meal. That said, in my initial rig I’m going to have a midge larva to start, and progress to a midge pupa if and when I start to see a few midges hatch. Three bugs under an indicator is legal where I guide, so now I have to decide on the next two bugs. If you know me, you know I like to throw San Juan worms year round. Trout eat worms. Some folks scoff at the San Juan worm, but I like it because it’s a bigger offering, and when you hook fish on the bigger hook, they seem to stay buttoned all the way to the bag. I’m not too elite to catch fish, my guiding depends on it. In these water conditions, I’m not too concerned with fly color. With all that slush, light isn’t penetrating very deeply below the surface, so I think fish see these bugs as light or dark. Factor in winter sun angles and a cloudy sky and even less light protrudes. For this reason, I ran a tan San Juan. Profile is key, a lot more so than color in this case, so I figure tan will do the trick, and show up for the fish. My other two bugs are conditional bugs. Already talked about the midge larva, so I had to make a choice on the third bug. In this case, I went with a size 16 soft hackled Hares Ear. Why? 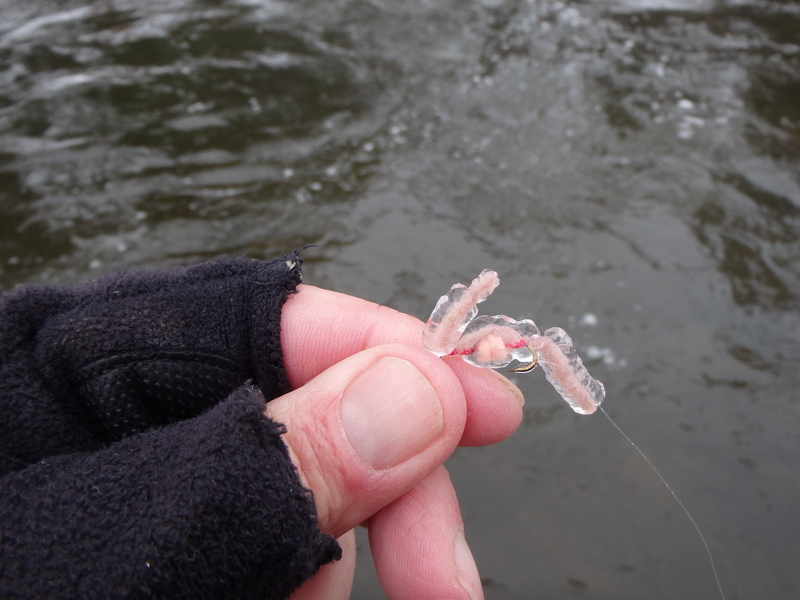 Well, the Hares Ear is lighter in color, has a tungsten bead for sink purposes, and I feel that many PMD, Drake and small Stoneflies are getting dislodged from their holds and kicked to the current from the ice/slush flow. Having confidence in your fly selection is huge, and fighting the urge to continually change flies pays huge dividends as you master the water conditions. In other words, once you select bugs, concentrate solely on the drift. Depth and speed as always, are critical in any set-up you use. And, as mentioned, I went to high water tactics in an attempt to account for depth and speed. In high water, it’s easy to drift well above feeding fish because the bugs aren’t getting down to the target. It often appears to be on the proper level, but your flies drift harmlessly above feeding fish. This is because of intense drag on the surface AND the intense drag sub-surface. We know that the water surface is moving roughly twice as fast as water at grade. That’s a given. What a lot don’t realize is that your leader, below the indicator is prone to form a huge arc downstream from the indicator to the weight. This causes drag not easily seen if you just concentrate on indicator speeds. Drifts look good on top, but are sub-par below. Same thing was happening as we fished the slush. First thing we did was attempt to keep our casts short, nothing over 15 feet. Secondly, I shortened up the indicator to weight on the nymph rig to the minimum to help with line management and subtle winter strikes. That took some experimenting, because you still need to run the weight on the bottom, but too much leader would give way to too much chance the rig would just sit on the slush and never get to fish level. Next, I placed a BB shot about 18” below the indicator to help break the surface slush AND battle the effects of the arc in the leader below the indicator I previously mentioned. Knowing the fish would move minimally side to side to eat, I shortened the distance to about eight inches between bugs, and in some cases I modified that to six inches. Lastly, we discussed mending techniques to assist in getting the bugs down through the slush. The key was watching intently for the indicator to turn over. That tells me if we have a chance to get the right depths during the drift. I want that indicator to turn over in the first quarter of the drift, if it’s not, then a large upstream mend is in order. With this mend, the angler throws slack into the drift as well, attempting to get the indicator and fly line upstream of the flies. Basically, high water nymph tactics. Did we always break through the slush? Nope, but we knew mid-drift if we hadn’t and would go right into another upstream roll cast. It seemed that every “perfect” drift resulted in an “eat”. The fish were there and feeding, we just had to knock on their front door. By the way, we never hooked a fish on the midge patterns, but the soft hackle and the worm were on the menu! 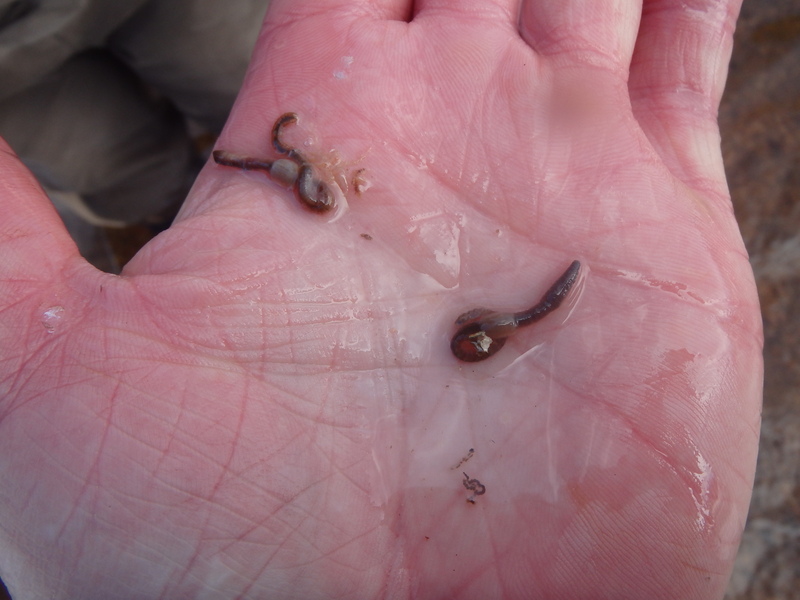 Yep, there’s a worm under the ice…. Scott Thompson pumping a fish in January. The results of the pumping. Hmmm, worms. Latest book has hit the shelves. Available at Stackpole, Amazon, etc. May is for love. August is for scuffling and fighting your way through the maze of thunderstorms, warm water, waning bugs and high skies. For a guide, the dog days of August are just about putting your head down and keeping moving. Fishing can be frustratingly tough and amazingly beautiful at the same time. Just the other day I had a couple from Florida. Morning started out at about 42 degrees and the water was a bit off color when we first got wet at about 7:30 am. Had a few eats and one in the bag in short order, but then BOOM, the water goes off-color. So much so, that we had to move upstream. We battled for about a half hour after our move just looking for feeding fish. Finally, I dropped into a stretch I’d never fished and BANG, we doubled up on a fine pair of Browns. Tough and beautiful. I’m pretty stubborn when it comes to bug selection and the nymph rig in general. The tougher the fishing gets, the more I dig my heels in and attempt to beat the fish by tiny, subtle adjustments to rigs and fly choice. I run my basic rig, whereas a lot of fly fishers increase leader lengths and go to smaller bugs, I stay with my usual lengths and usual sizes, and strive to refine speed and depth when nymphing. I try to match and stay ahead of the hatch as closely as possible, and I’m always looking for that third bug. What’s the third bug? It’s simply my money bug in any rig (Colorado it’s legal to use 3 flies). The first two droppers of my rig are the meat and potatoes of the rig. The third bug, now that’s the bug that’s supposed to be deadly. In August it’s hard to find that third bug. Referring back to the trip with the Florida couple, we caught fish on San Juan Worms, Mercer’s Golden Stone, a Soft-Hackled Pheasant Tail, and lastly, the third bug. The third bug did its job, but not with as much zest as I need in a third bug, so it’s off to the fly tying bench I go to make a few adjustments. Sadly, Suzie wasn’t rockin’ the river last week like she was and she will need to step aside for another bug to give it a rip. Oh she caught a few, but my third bug needs to produce, so she may be in mothballs til next June. 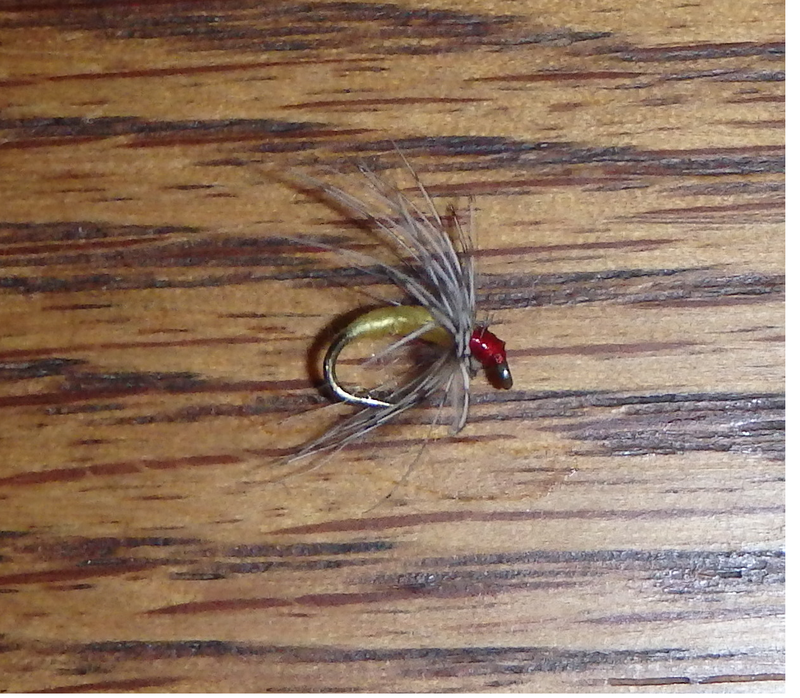 Now it’s time to sit down and tie a few patterns and give ‘em a shot on the Eagle as the dog days of August rage……….It’s gotta’ be part soft-hackle, part nymph, part emerger, perfectly sized and colored, can be dead drifted and swung, and most certainly needs to be……………. filthy. It deals with the building blocks of a good roll cast, nymph drift, and set. Please feel free to share it with those that are interested. Really enjoy filming on the river. More films and other stuff is on it’s way. Til then Fear No Water! Hope all has been going swimmingly for all of you folks. I’ve been staying busy, writing, speaking, picture taking, film-making, tying, and running my pheasant dogs. Things are good. As I mentioned, I’ve been doing a fair amount of speaking, and at this time I’ve about a dozen gigs scheduled this year. I expect a few more to trickle in. My main presentation deals with mastering technical water. The talk revolves around catching big, selective tailwater trout. Trout that are highly pressured and more than a little “experienced”. A small part of the presentation deals with how to attack technical water you’ve rarely or never fished. Without going into technique at this time, and assuming that the technique used is fundamentally sound, I talk about 3 aspects that go into selecting the proper flies to throw. The 3 aspects are historical data, seasonal data, and conditional data. Let’s break’em down. Historical data is data that can be gathered accurately from several sources. This data is about which bugs are typically active or hatching historically, or the same time every year. Notice I said “active or hatching” That’s critical, and we’ll hit on that in more detail a bit later. How do you acquire historical data? There are several good sources. One good place to visit is your state’s wildlife organization. With a bit of digging you can find some good info there. Also, join an organization, like TU, or send them a question if you’re out of state. Calling a river specific fly shop is always a good idea to find out which bugs are prevalent at certain times. There are also river specific blogs, river reports, and fly fishing forums you can join in on. Historical data is fairly simple to find. Seasonal data is basically taking historical data to the next level. I look at seasonal data as “What’s going on with the bugs at this time?” You may have a good handle on which bugs, hatch when historically, but seasonal data further refines the information. 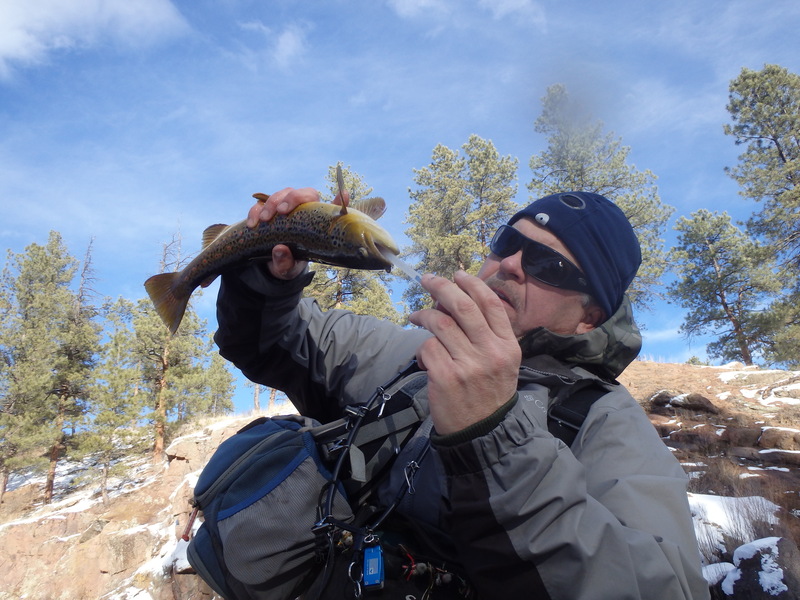 For example, on the South Platte this winter we have been seeing about a size 22 midge. Historically, we will begin to see a larger midge come into the picture soon. It’s a crap shoot when it will start to pop in earnest, but I know seasonally, it will come off. The “season” or seasonal factors will determine the hatch. Factors such as unusual cold snaps, non-historical flows and water temps, and even previous factors can put things off or ramp them up seasonally. Maybe that low water we had last summer killed off certain nymphs. That’s seasonal data. To take advantage of seasonal data, again ask your local shop what’s going on, and look to several sources that I mentioned earlier. Back to the South Platte. I can observe the small midge coming off during the day, and I know historically the larger midge will soon start to hatch, so I will set-up my rig to capture seasonal data by incorporating a larger midge along with the small midge to prepare for the “active” large midge nymphs. Look at seasonal data as the transitions between the main hatches. Prepare for the caddis as you fish Blue Wings. Prepare for PMD’s as you fish with Blue Wings. You get the idea. It’s another way to stay ahead of the hatch, seasonally. The last bit of data is gathered on the river the day you put your boots in the drink. Conditional data is just that, what’s it like today and what bugs are hatching? 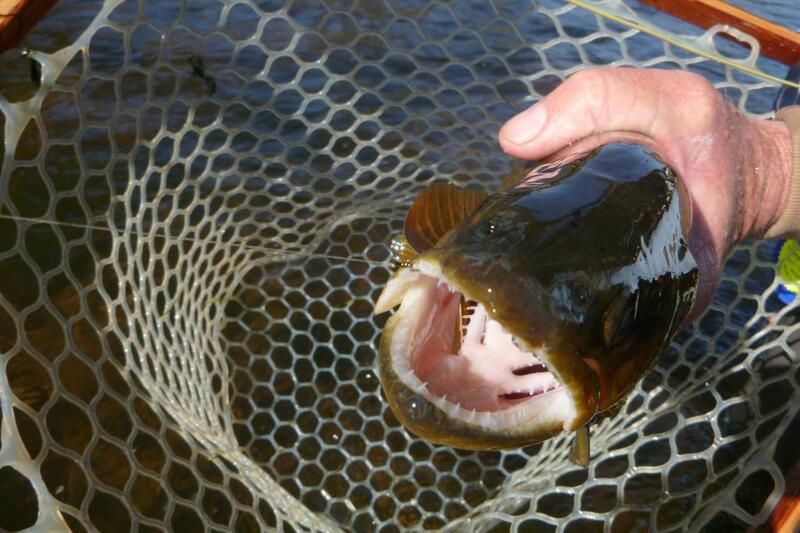 This fish pictured fell prey to a Chocolate Thunder, a Blue Wing emerger. This was a “conditional catch” in that, the day was overcast, and the Blue Wings really came off more than a sunny cloudless day. 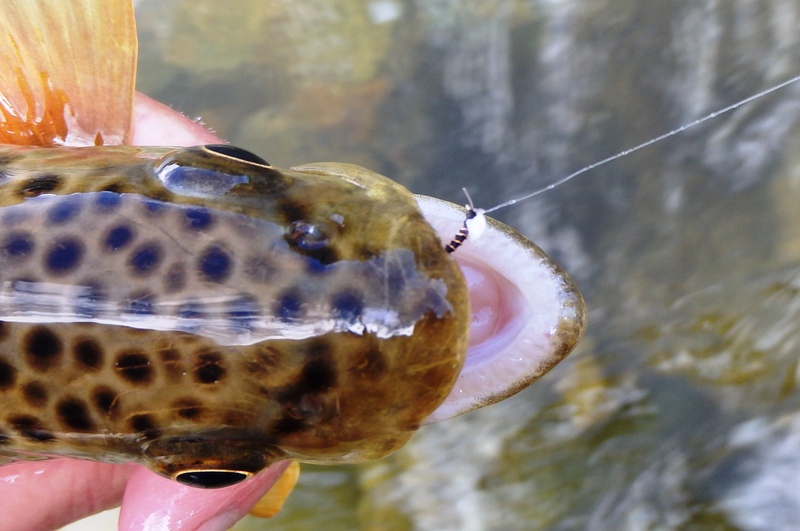 The hatch was prolific, and lasted longer than normal, allowing the fish to get really dialed in to feeding on emergers. Conditionally, it was a no-brainer. So, look at weather conditions to give you valuable clues to bug activity. Is it cold, hot, windy? Is a front coming in, moving away? How about water conditions? Murky or off-color? Low or high? How about angling pressure? These are all observable factors that come into play. 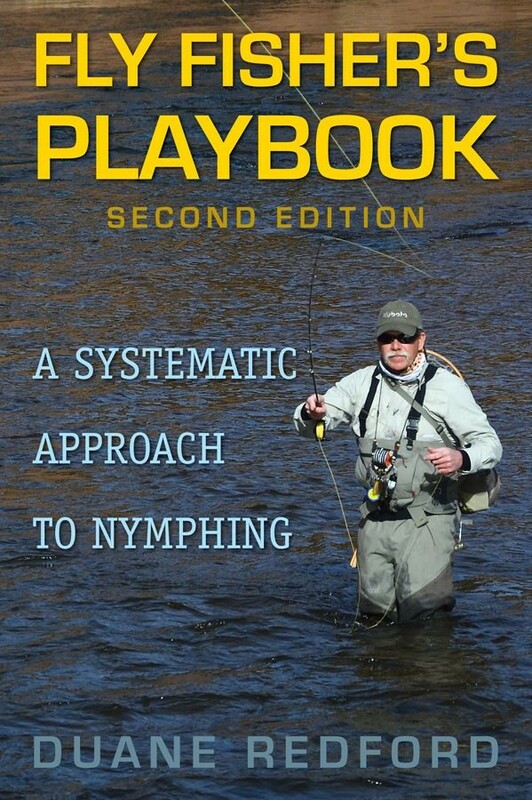 In The Fly Fishers Playbook, I have gone to great lengths to try to explain how to fly fish conditionally. It’s that important! When you combine historical data, seasonal data, and current conditions toward fly selections you are more than ahead of the game. 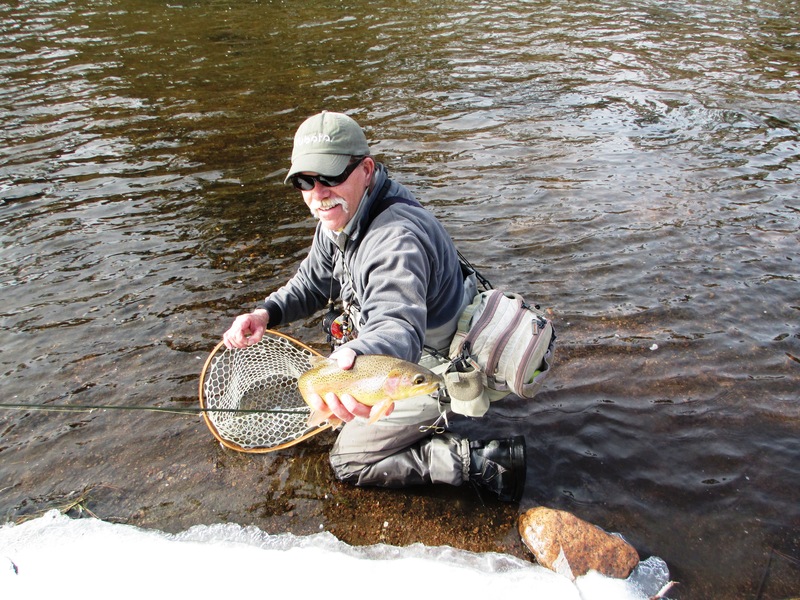 It’s fairly simple and goes a long way toward fly fishing success. So, the next time you get ready to fly fish a river, go armed with proper data, and combine that with the days’ conditions so you don’t have to stand knee deep in the river scratching your head over your flybox.